Finding the right place to open an indie restaurant can be a headache for many owners. A mall? Too mainstream. A tucked-away space in a hip, far- flung enclave? Inconsistent traffic. One happy medium, some restaurants have found, is to open in a hotel. It is an arrangement that benefits both parties. The eateries are likely to get a steady stream of customers who are guests at the hotel. The hotels, on the other hand, can tap the food and beverage experience of the restaurant owners, without having to worry about setting up their own culinary team. The latest resto-in-a-hotel set- ups include Asian fusion restaurant Froth at Ascott Raffles Place; seafood-centric restaurant Gills N Shells at Hotel Boss in Jalan Sultan; and The Rabbit Stash and Hareloom Cafe & Bar at klapsons, The Boutique Hotel, off Tanjong Pagar Road. Chef Matthew Mok, 41, who owns The Rabbit Stash and Hareloom, handles all the food matters at klapsons, from providing toasties and yogurt for breakfast to serving bar food for the in-house bar, Fabrika..
A unique perk is that it has allowed us to meet people from diverse backgrounds from around the globe, who share with us about the F&B scene in their home countries. Mr Alex Loh, 37, general manager of klapsons, says the hotel, which recently revamped its rooms, was looking for a home-grown food and beverage brand. The hotel had been running its own restaurant since it opened in 2009. Besides having an F&B operator to prepare breakfast for guests, Mr Loh says the "bistro-style" setting at Hareloom "would resonate well with the lunch and dinner working crowd". Over at Gills N Shells in Hotel Boss, the chance to expand one's clientele to include international diners is also a plus point. Mr Jayson Tan, 30, the restaurant's founder, says: "A unique perk is that it has allowed us to meet people from diverse backgrounds from around the globe, who share with us about the F&B scene in their home countries." Although a hotel setting has lower footfall compared with a mall, he believes that "Singaporeans are adventurous". "They are more than willing to travel to experience new places and new kinds of food." These restaurants add to others that have set up in hotels in the past few years. They include Indian restaurant Table by Rang Mahal in Naumi Hotel in Seah Street; Italian restaurant Casa Tartufo at The Scarlet Hotel in Ann Siang Hill; as well as the cluster of restaurants at The Club Hotel in Ann Siang, such as Peruvian rooftop bar Tiger's Milk, modern European restaurant The Disgruntled Chef, B28 bar and Mr & Mrs Maxwell's restaurant. 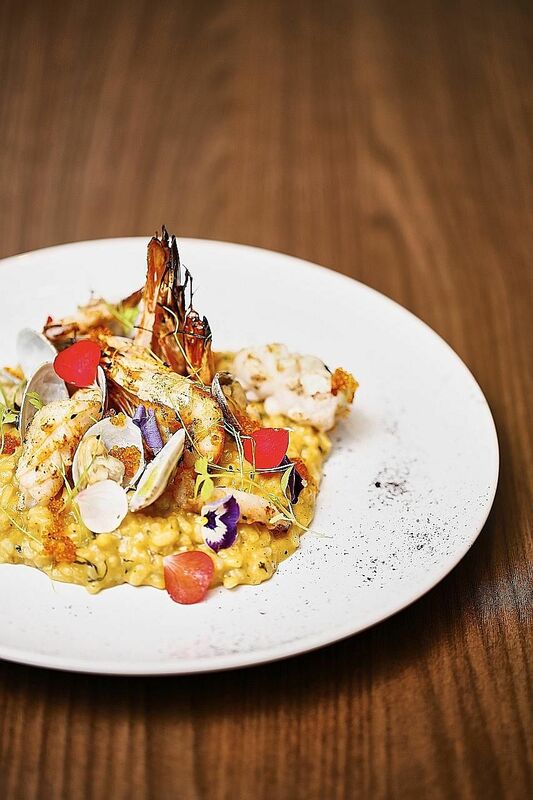 Casa Tartufo moved into The Scarlet Hotel in September last year, when the three-year lease on its previous location at Forum The Shopping Mall in Orchard Road expired. The relocation included the opening of its rooftop bar Aria. Mr Alex Calabro, 43, owner of the Casa Group which owns Casa Tartufo, says The Scarlet Hotel is a good fit for him, with its shophouse charm and proximity to the Central Business District, where many of his customers work. He says: "When the hotel is full, it is better for us and we also bring guests to the hotel. It works both ways." Next month, he will introduce more degustation menus. He is also thinking of using an area of the rooftop for fine dining. Of course, as expected in the tough F&B scene, opening in a hotel has its challenges, says Mr Eric Tan, director of Table by Rang Mahal. He cites examples such as having longer operating hours to cater for breakfast and supper, as well as providing options for room service and private functions. He says: "As an operator, we need to be versatile enough to meet all these challenges before any hotel will warmly welcome us as a partner." In five years, modern European fine-dining restaurant The Rabbit Stash has moved from multiple locations - from condominiums to boutique hotels. It started out in 2011 at Pandan Valley Condominium before moving to another condominium - Alexis in Alexandra - two years later. Then, after a year at Wangz Hotel in Outram, it has found a new home at klapsons, The Boutique Hotel. All this, to ensure a sense of "exclusivity", as well as a more cosy location for dining. The seasonal menu at The Rabbit Stash, following home-grown chef Matthew Mok's "Ensophi" culinary philosophy - exotic, nostalgia, soil, ocean, pristine, heritage and impression - make up the seven courses for the dinner degustation. He says the location of the restaurant always complements the cuisine. 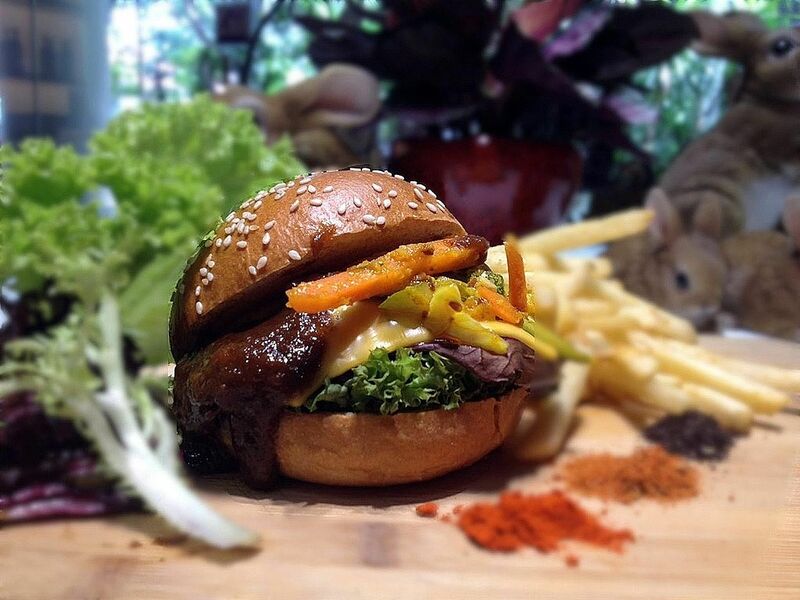 "The Rabbit Stash at klapsons, The Boutique Hotel or The Rabbit Stash at Junction 8 in Bishan? Certainly, the former option will appear more integrated." With the move comes the opening of its sister cafe, Hareloom Cafe & Bar. Both outlets share the same 2,000 sq ft indoor dining space and chef Mok, 41, is looking to include outdoor seating soon. For a more casual meal at Hareloom, expect dishes with a Singapore twist, such as 48-hours braised pork "bak kut teh" spaghetti ($10.90), seafood laksa pesto linguini ($12), pan-seared foie gras with fruit rojak ($8) and beef cheek rendang burger with achar and Cajun fries ($12.90). After six months of scouting locations, the owners of modern European seafood restaurant Gills N Shells settled on Hotel Boss in Jalan Sultan. It is slightly off the beaten track compared with locations in town, but is within walking distance of Lavender MRT station. The location overlooking the Rochor Canal also suits the beach-themed restaurant and seafood-centric menu. The restaurant's founder, Mr Jayson Tan, 30, says: "It also has ample parking spaces, compared with some of the other standalone outlet venues I visited." Co-founder and executive chef Podisingho Xavier, 42, puts a fusion spin on dishes. 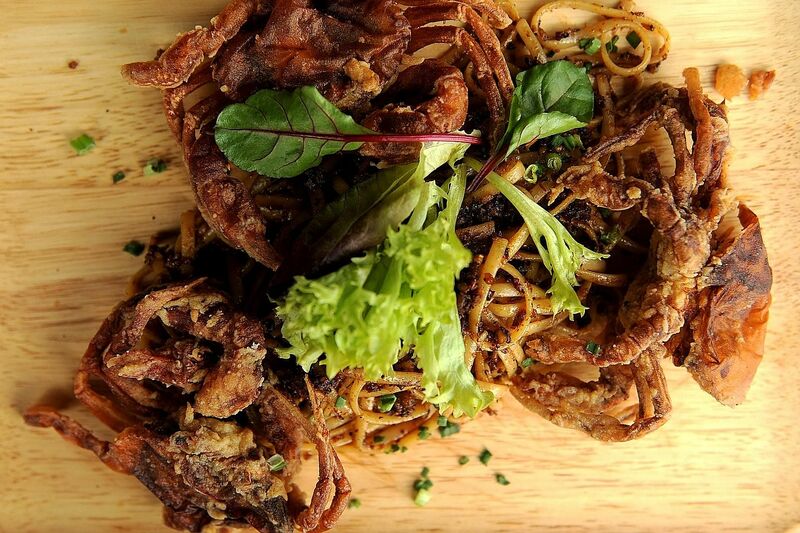 Highlights at Gills N Shells include hae bee hiam pasta with soft shell crab ($18.90); salted egg pasta with grilled tiger prawns ($18.90); and truffle-infused cod, which is topped with chye poh (preserved radish). Other options include baked oysters with bacon, cheese and herbs ($25.90 for six); lobster roll ($24.90); salmon burger ($17.90); and Gills N Shells crab cakes ($12.90). Previously located at Big Hotel in Middle Road, Froth - known for its Asian-inspired Western cuisine - moved to Ascott Raffles Place two months ago. That was because Big Hotel was sold to Hong Kong- based real estate investment group Gaw Capital Partners, which is bringing in its own tenants. Froth's marketing manager, Ms Sharon Lin, 31, says: "We decided to move into another hotel as we already have experience working in one and also have the required expertise to serve breakfast to hotel guests. "Also, when we were looking for a new location, none of the malls we were looking at was letting out space and other places we surveyed did not attract us in terms of pricing or location." From this week, the 140-seat restaurant's menu will feature more Asian fusion dishes. These include seared barramundi with Asian slaw, squid ink lobster burger and Nonya lasagna, adding to menu favourites such as seafood tom yam risotto and five-spice wagyu burger. It also introduced a weekend kids' menu yesterday. With every purchase of a main course, one child will get a kids' meal free. Dishes include Volcano Mash ($8.90++), with mashed potatoes, smoked chicken bratwurst, carrot wedges and broccoli; and Noodle Nest ($8.90++), where two hard-boiled eggs - styled to look like a bird - are perched on a nest of buckwheat soba noodles. For infants, there is housemade pumpkin or sweet potato puree.